Frederick Douglass said, “Once you learn to read, you will be forever free.” Yet even today, the city where he learned to read is struggling to provide that most basic opportunity to many of its children. The need for the Maryland Book Bank’s programs is great in Baltimore, where the majority of public school students are from low income families. The disparity in access to age-appropriate reading materials in lower and higher income neighborhoods is well-documented, at one book per every 300 low-income children compared to 13 books per average middle and higher income child. This disparity has dire consequences for low-income youth. Only 14% of Baltimore City fourth graders were proficient in reading on the most recent National Assessment of Educational Progress, making them at least four times as likely to drop out of high school as their peers who meet this critical proficiency benchmark. Schools are struggling to get books into children’s hands. Baltimore City has 130 Title I schools and faces a $130 million funding gap for the 2017-2018 school year, roughly $1 million per school. Funding for resources and enrichment is being cut just to meet mandatory requirements for staffing. School librarian positions are often eliminated, meaning library services are suspended. MBB currently has applications for a bookmobile visit from more than 200 schools, evidence of high unmet demand for this service. Access to books at home is important—studies have shown that even 20 books in a home library can mediate the effects of low educational attainment among parents. Further research suggests that to improve reading ability, young people need access to books aligned to their skill level and interest. The Maryland Book Bank (MBB) seeks to bridge the literacy gap through increased access to quality age-appropriate books in homes, classrooms and community settings. We do so by equipping students, parents, teachers and local organizations with the power to choose age-appropriate books to build their own libraries. We bring the books directly to schools through our Bookmobile and Home Library Programs. 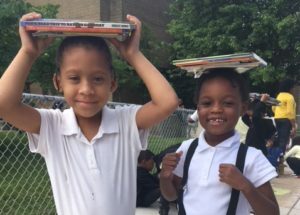 We also pack and deliver books for a number of social service and early childcare centers and programs within Greater Baltimore, such as Reading Partners. Finally, we offer free or low-cost memberships for teachers, families and organizations to select books in bulk from our warehouse location each month.